[Note: see this post of September 27, 2018 for important further data concerning the fate of Zett’s brewery and Louis Wehle’s attempt to revive that business from 1934-1937]. 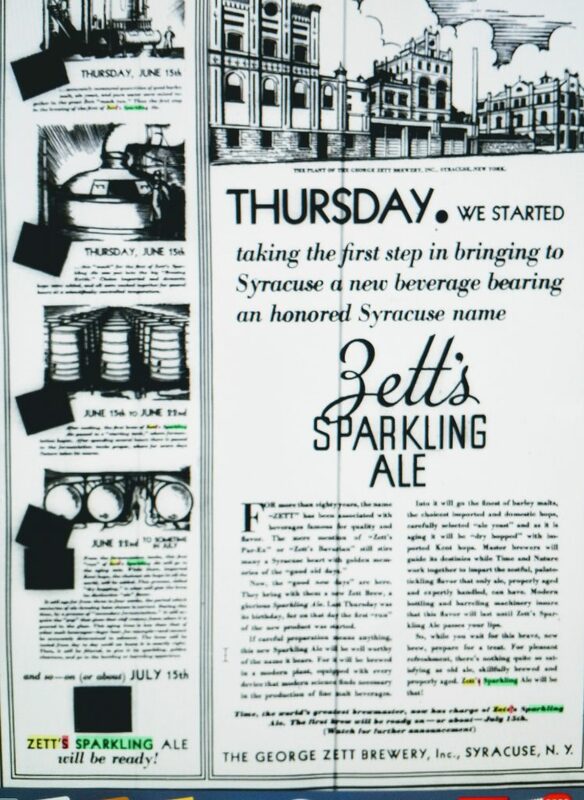 A series of press stories in Syracuse, NY between 1932 and 1937 tells the story how one venerable pre-Prohibition brewery, Zett’s, returned to the market with a splash only to flounder within a year of start-up. How this could happen for a brewery with such promise is hard to understand. True, most of the local heroes that returned to business in the 1930s left the scene within a decade or two. Haberle-Congress lasted longest, until 1962. But to last only a year? Zett’s was founded in 1855 or 1858 (accounts vary) by Xavier Zett, a German immigrant. His great-grandson George Zett 3rd, a trained brewer, was part of a consortium to bring the brewery back in 1933. Louis Wehle of the newly-revived Genesee Brewery in Rochester, NY played both an investment and managerial role in the new Zett’s, and was President and a director. George Zett 3rd was a senior officer, and other prominent businessmen were involved in management and stock ownership. Wehle/Genesee had the controlling interest. Their investment funded an impressive upgrade of a historic but out of date brewery and what seemed an effective ad campaign. Yet by 1935 Zett’s Brewery was in federal bankruptcy proceedings. Genesee decided to make a further investment to permit operations to continue. The board was reorganized to afford a greater involvement by Syracusans, and the name was changed to Syracuse Brewery Inc. Beer continued to issue, one, Dickens Ale, had the inscription “Genesee” over the name. In late 1937 Syracuse Brewery Inc. was shut down. This news story states that it was purchased, on payment terms, by a John W. Harrison, the treasurer of the Syracuse Brewery Inc. A hand-drawn spreadsheet in a Facebook page on historic Syracuse breweries, Beer in the Salt City, suggests the brewery continued to operate for two years, until 1939, but this is unclear. After that, nothing. Today at the corner of Court and Lodi only a small rump in brick remains where a fine complex once prospered. The ad pictured above, from June 18, 1933, is from a newspaper in the archive of the Fulton History website, as the other news stories linked herein. The ad described carefully various steps in mashing, brewing, and fermenting the first batch of Zett’s Sparkling Ale for a presumedly rapt public. There seems an intermittent tradition in Central New York to describe the technics of brewing in newspaper advertising. We have seen instances, both in Utica, in 1907-’08, and the 1960s. Nothing less than Kent English hops, perhaps the finest in the world, were used to dry-hop Zett’s ale. Fermentation was started in a large tank and finished in small, wood fermenters that look like the old English pontoons. The beer was aged for one month, less time, the ad noted (perhaps inadvisedly), than for lager beer. Advertisements from others that year congratulated Zett’s on its achievement in returning to market. They were placed by suppliers or contractors who had worked on the refurbishment. Zett’s seemed to have everything going for it, but didn’t make it. To be sure, it had competition: Bartels, Moore & Quinn, and Haberle-Congress were just some. But there was room for all of them before 1920, why not now? It’s hard to answer this without doing an in-depth study of the economics of brewing in 1930s Central New York. For example, further west in the state, Wehle’s Genesee Brewery grew steadily from its restoration in 1933. On the other hand, it benefitted from Wehle’s deep pockets, he had made a fortune from the bakery business he established in the 20s after giving up brewing, before re-entering the field upon Repeal. And while incipient national brands had started to appear in regional New York, the beer market in 1930s Syracuse was still mostly local judging from a rare beer list in a period menu on the Facebook page mentioned. Wehle was a talented businessman and brewer, but could stretch himself only so far. The 1930s, too, was the Depression era, not the best time to launch new businesses even in beverage alcohol. It seems as well Zett’s was a little late returning to brewing. Moore & Quinn were first in April, 1933 but summer had already started before Zett’s marketed its first brew. Maybe first to the bar (!) retained the public’s affections long-term. Finally, and perhaps fatefully, Zett’s, which made many styles before 1920 including ale, porter, lager, and German brown beer, returned to market with an ale. Was something that the best thing to present to a post-flapper generation of American beer drinkers? The other breweries in town made ales too, but many also made lagers. The most successful brand was Congress Beer from Haberle-Congress. Maybe Zett’s ale with its floral English aroma was too exotic for the local crowd. Yet, ale was clearly the plan from the beginning as the 1932 story linked in the fourth paragraph above states clearly: Zett’s was to be an ale brewery only. 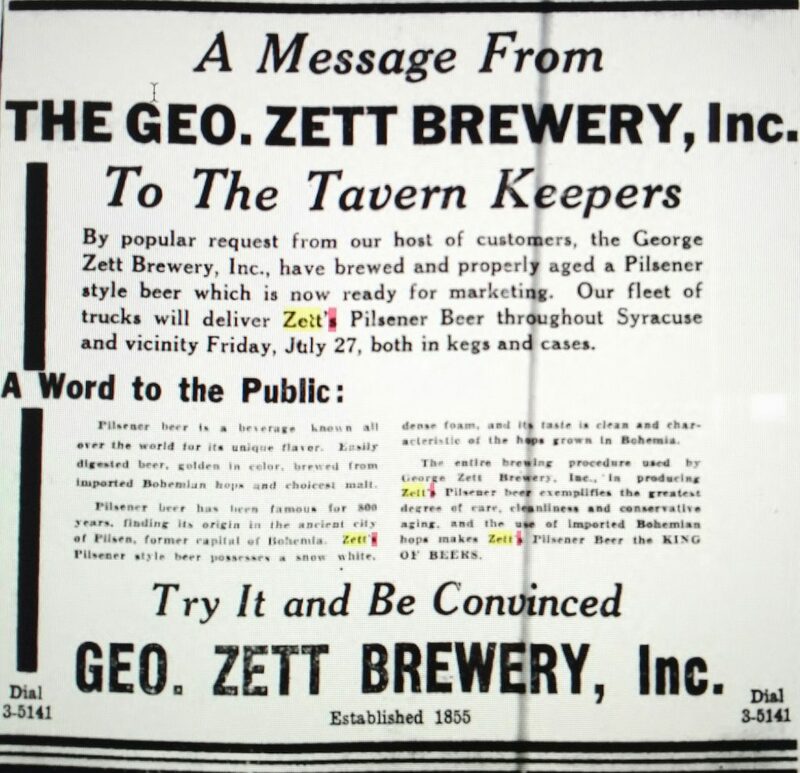 This ad from July, 1934 shows that Zett’s finally introduced a pilsener beer, touting it to tavern-keepers with a description of its pedigree. If that was intended to save George Zett 3rd’s brewery, it didn’t. N.B. Congress Beer is returning to the Syracuse area this month, or in a manner of speaking as the beer is not quite a replica. See this story for details, from The Daily Orange. All to the good, certainly. Note re image: the images above were obtained from the Fulton History newspaper archive as identified and linked in the text. All intellectual property in the sources belongs solely to the lawful owner, as applicable. Images used for educational and historical purposes. All feedback welcomed. The Beer Buffet: Ein Bier, Kellner!